THE RELATIONSHIP BETWEEN Margaret Thatcher and Fine Gael Taoiseach Garret FitzGerald was generally considered to be a productive one. Prior to FitzGerald coming to power between 1982 and 1987 there had been little engagement of note between the British and Irish governments regarding the perilous situation with the Troubles in Northern Ireland. From that point of view the Anglo Irish Agreement (AIA) of November 1985 was a noteworthy achievement, in that it at least meant that some manner of constructive dialogue had begun. But Thatcher was a force to be reckoned with, and no-one knew it better than FitzGerald, having been on the receiving end of a media savaging after Thatcher’s dismissal of his New Ireland Forum in May 1984 with her infamous ‘Out, out, out’ press conference. Prior to the announcement of the AIA at Hillsborough Castle, Belfast on the morning of 15 November 1985, the Taoiseach and the Prime Minister had an hour together to gather their thoughts. A transcript of the conversation has now been revealed by the National Archives under the 30-year-rule. 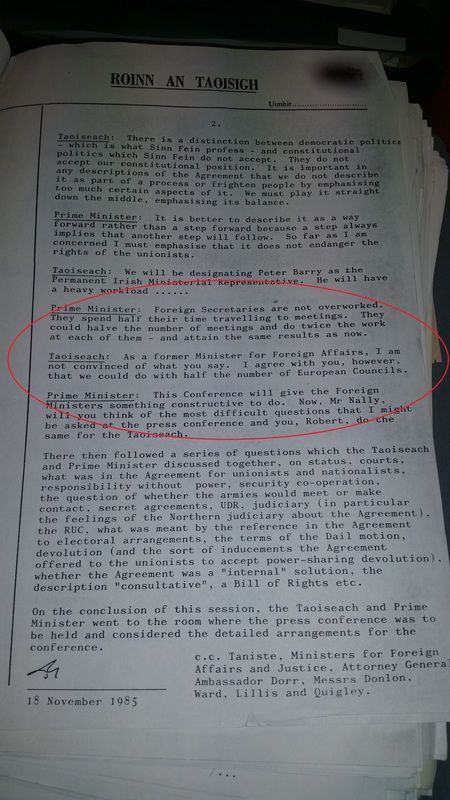 FitzGerald suggested that his Minister for Foreign Affairs Peter Barry would be the first Irish ministerial representative to the Anglo Irish Conference, the title for the new working relationship the two governments were set to unveil. “He will have a heavy workload,” he said. “Foreign secretaries are not overworked. They spend half their time travelling to meetings. They could halve the number of meetings and do twice the work at each of them – and attain the same results as now,” replied Thatcher. “As a former Minister for Foreign Affairs, I am not convinced of what you say,” said Garret primly. Email “When Maggie dropped some epic shade on Garret FitzGerald...”. Feedback on “When Maggie dropped some epic shade on Garret FitzGerald...”.